Maverik is a regional convenience store and gas station chain that operates more than 270 locations across 10 western states. Over the past 15 years, it’s built a distinct brand identity around adventure, sports and the outdoors, epitomized by its tagline “Adventure’s First Stop,” and the brand wanted to convey that adventurous spirit through digital signage. But Maverik’s traditional backlit posters and static print advertising in its stores and facing the gas pumps were losing their ability to connect with customers. The brand wanted to showcase high-energy videos and digital content that both entertained customers and promoted products and loyalty programs. Working with RevelTV and Samsung, Maverik has rolled out a digital signage program to capture customer attention at key touch points throughout the stores. The deployment includes digital menu boards and promotional displays on its soda dispensers, as well as high brightness displays in the window facing the gas pumps. The results have been impressive: increased foot traffic into the store from the pump, sales lifts on promoted items, and glowing customer feedback. 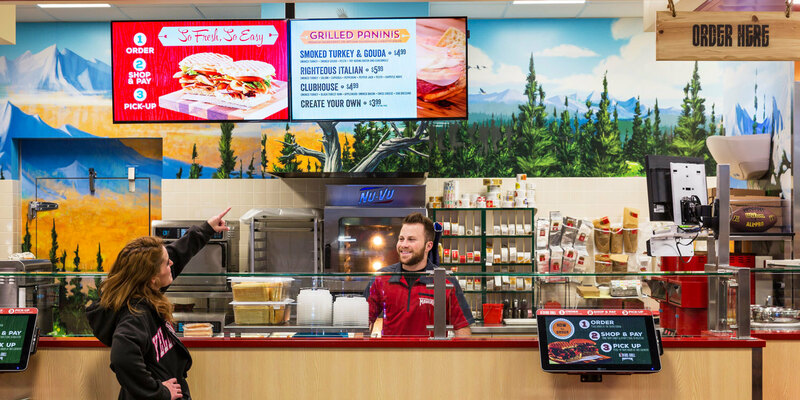 Read the case study below to learn how Maverik planned its digital signage rollout and how it’s benefiting this dynamic brand.